The government's historic trial to block the two companies from merging is underway. Federal regulators argue such a combination would violate antitrust laws, in part because cable customers' bills would rise. But for AT&T and CNN parent company Time Warner, joining forces is all about survival. The media industry has been upended in recent years by a handful of internet and tech companies — most prominently Facebook, Amazon, Apple, Netflix and Google. Each is offering video content -— the live sports, scripted shows, reality series and movies that used to be the exclusive territory of cable and broadcast networks and movie studios. Internet companies have also built formidable distribution platforms that they can use to deliver shows and movies directly to customers. That means they don't need to rely on traditional distributors like Comcast (CMCSA) and AT&T (T) to do the job for them. "This is a landscape-changing situation. The media industry is never going to be the same, whichever way it goes," said Porter Bibb, managing partner of Mediatech Capital Partners. 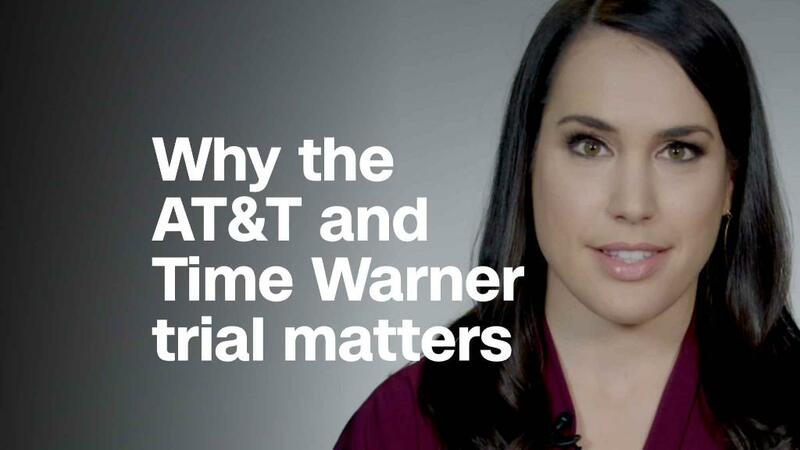 AT&T and Time Warner's lead litigator, Dan Petrocelli, told district court judge Richard Leon on Tuesday that dominance of internet companies is a huge reason why AT&T, a distributor, wants to buy Time Warner (TWX), which owns content creators like CNN, TNT, HBO and Warner Bros.
"We're chasing their tail lights," Petrocelli said, adding that the five major tech companies have "completely transformed the industry overnight." The Justice Department, meanwhile, has argued that businesses like Netflix don't directly compete with conventional cable distributors. The government's lead attorney on the case, Craig Conrath, acknowledged in court earlier this week that there has been "transformative change" in the media industry, but he argued Netflix is "mostly a complement" to conventional cable -— not a substitute. Gene Kimmelman, the president and CEO of the consumer advocacy group Public Knowledge, agreed. He said there's a "fundamental difference" between being a major cable provider like AT&T and being a streaming service like Netflix, because AT&T would be in a position to "harm competitors" who want to air channels like CNN, TNT and TBS. "[Competitors] will be beholden to AT&T, and the price that AT&T charges, the terms and conditions AT&T will create," he said. Bibb argued AT&T has to be more than a pipe for the internet if it wants to survive. "Content is king," he added. "AT&T has to get content, or they are going to be dismissed as merely a wireless distributor, and there are very severe constraints and limitations to how they can grow beyond that." AT&T and Time Warner are far from the only ones in the industry to consider consolidation. Comcast successfully took over NBCUniversal several years ago. Verizon (VZ) bought AOL and most of Yahoo. Discovery (DISCA) just bought Scripps, the owner of HGTV and the Food Network, and is eyeing a Netflix-style streaming service for its brand of unscripted TV shows. Viacom (VIA) — the MTV and Nickelodeon owner — is also exploring a CBS merger. CBS (CBS) already has its own direct-to-consumer service. And Disney (DIS) reached a deal to buy much of 21st Century Fox (FOXA) for about $52 billion. Disney announced a streaming service for its own content to come next year — and it's cutting ties with Netflix ahead of the launch. The combined companies will also control most of Netflix-competitor Hulu. "Telephone, wireless, pay TV delivery and content are all coming together," said Jeff Kagan, a telecom industry analyst. "That's all AT&T is doing." Yet Kimmelman said AT&T and Time Warner is just one of several media deals that could be "dangerous" to consumers. "My fear is that if AT&T succeeds in winning this case, we're going to see an avalanche of more consolidation," he said. "It will be almost a nuclear race to combine all the top networks, all the most popular programing, with the few transmission companies who are left." How will Apple create its media empire? Meanwhile, Amazon (AMZN) and Netflix (NFLX) continue to grow, as cable customers cut the cord. Apple (AAPL) already sells subscriptions for music and storage services, and it's rumored to be spending a lot of money on original programs this year, stirring speculation that it may one day launch its own dedicated video streaming service. Facebook (FB) and Google (GOOG), meanwhile, wield tremendous power over the digital advertising marketplace, which is an important chunk of revenue for major media companies. Google also owns YouTube, another video giant. Netflix has also done its part in trying to beat back its legacy competition. The streaming giant, which has 118 million subscribers, expects to have about 700 programs available for customers this year, including a growing array of foreign-language shows. And as a show of how times have changed in the industry, Netflix recently spirited away marquee TV producers Shonda Rhimes and Ryan Murphy to make exclusive content for its service. Rhimes created hit shows like "Grey's Anatomy" and "Scandal" for Disney's ABC, while Murphy was the mind behind "American Horror Story" on Fox's FX. --CNN's Hadas Gold and Brian Stelter contributed to this report.